Charlie has the ability to bowl at good pace and proved he can hit good areas quite consistently. His action at present is suited to angling the ball into RHB and across LHB and can make it tricky to go the other way. 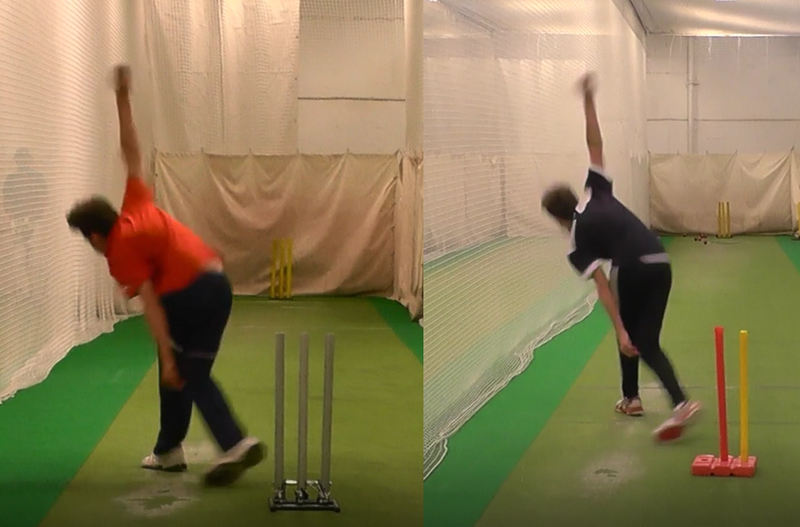 Charlie did explain he does have the ability to seam the ball the other way outdoors in matches, which is understandable given his wrist position at release. - Ensure run up/approach is rhythmic & builds momentum up into the crease (starts off quite quickly on occasions which can make it feel lengthy spending energy early on when setting off). Allow opportunity to attack the crease. - Falling away at delivery starting going into bound; consider practising not going up quite as high through bound to create more forward momentum which would compliment alignment a little more. Fall away starting at bound is then amplified by front arm & head opening outwards - bottom half then having to work hard to stay upright (so front foot splays). Currently a bit more susceptible to injuring lower back, oblique/lats muscles.